"The First Time" is a video project, realized by FashionDaily.TV in cooperation with Art is the Alibi. 3 females shoot for the first time. With a real large caliber weapon. In the first sequence, the viewer sees in slow-motion only the face of the shooteresse, without knowing what she is about to do. The act of 'shooting the gun' is deliberately separated from the portrayal of the emotions and their facial expressions, that the shoot triggers in the woman. The aim is a detailed inspection of such emotional expressions. The second part of the video divulges the model of the gun as well as the brand of the blouse - in an irritation fashion, hence equally important for "The First Time"
"The First Time" ist ein Videoprojekt, das FashionDaily.TV in Kooperation mit Art is Alibi umgesetzt hat. Drei Frauen schießen das erste Mal mit einer echten Waffe. In Slow-Motion bekommt der Zuschauer in den ersten Sequenzen der Videos ausschließlich das Gesicht der mit der Waffe schießenden Frau zu sehen, ohne zu wissen, welcher Tätigkeit sie nachgeht. Der Akt des "mit der Waffen schießen" wird bewusst für den Zuschauer getrennt, von der Emotion, die der Schuss bei den Frauen auslöst. Es ist die Zielsetzung eine detailgenaue Betrachtung der Emotion darzustellen. Im zweiten Teil des Videos wird das Modell der Waffe und das Label der getragenen Bluse genannt - auf eine irritierende Art- und Weise gleichermaßen wichtig für "The First Time". 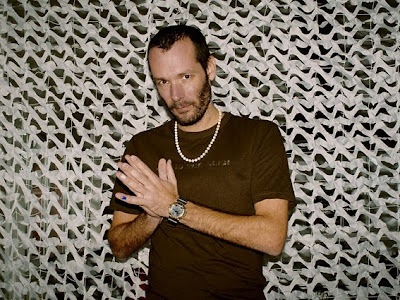 Rikki Kasso is represented by ART IS THE ALIBI Ltd.
And that's how the big dudes of CASIO see our man Jan Mihm in the flesh. And in their 25th G-SHOCK birthday book. This special G-SHOCK model is modified by “ART IS THE ALIBI LIMITED”. Please be aware that this model is not covered by CASIO’s warranty. Art is the Alibi is pleased to realize Quasi, a new project conceived by Charlie Müller, a street artist based in Berlin. 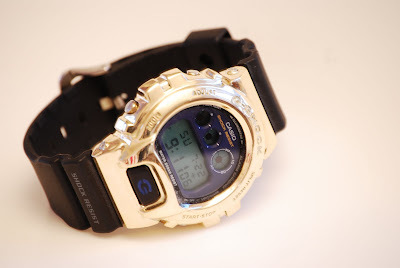 Quasi (2009) is a modified Casio watch who has a solid 18 karat gold case, making it the most expensive Japanese brand of watch ever produced. However, the rest of the elements are original from the 100 Euro G-Shock watch. Purposefully straddling both the art and commerce by having it be both a sculpture and a watch, Müller uses Quasi as a litmus test to explore philosophical ramifications of identity—both corporate and personal—through material, audience, and product design. In Theseus' Paradox, a wooden ship's parts have been replaced until none of the original parts are from of the original ship. Is it then the same ship? At which point does it cease to be the same ship? When the artist cast resin parts into gold ones is it still a Casio watch? When the materials are different, albeit more valuable, but the design is the same, does that make „Quasi“ a counterfeit Casio watch, much like the counterfeit goods maligned in the press today? The artist has chosen to modify a Casio watch because its affordability encourages a young street-culture following, the reception of which defines the watch and its role in society. Originally created as a durable sports watch, a Casio g-shock watch is designed to imbue a masculine sensibility with its pared down no-frills design coupled with rapper and sportscar advertising. As a watch is one of the few accepted pieces of masculine jewelry, the wearer believes that the watch embodies and externalizes certain qualities of himself. However, if affordability and modesty have been replaced on its exterior with gold and a high price tag, would this reject its original core audience? By entering this artwork into the commercial market, Müller examines the ease in which the wearer sheds these plastic trappings in favor of gold, even though with this transformation the wearer believes the brand-tenants—masculinity, youth, and toughness--to be the same. Perhaps, in believing the gold watch to be the same proves that there is still that inner Casio street kid ticking inside of us. The fear, though, of being encased in plastic for eternity, as time ticks away, sways the buyer and the wearer to go for the gold, hoping to encase his own youth in an quasi-effervescent immortality. Art is the Alibi is an incubator and boiler plate for discovering international ideas and realizing them as artistic projects. Art is the Alibi's focus is fostering emerging and up and coming regions, both geographically and contextually. Founded in London, Art is the Alibi's headquarters have just been relocated to Berlin, the epicenter of emerging culture. ... was the man who came up with the name of our gallery. The least we can do to thank is showing some of his work as our first exponates. Ever. But we will do more than that: Next week, we will print shirts with his work(s) on them. Art is the alibi. j@art-is-the-alibi.de, Tel. : +49 1570 666 4440. Rechtlicher Hinweis: Trotz sorgfältiger inhaltlicher Kontrolle übernimmt der Herausgeber keine Haftung für die Inhalte externer Links, für die ausschließlich deren Betreiber verantwortlich sind. Diese Webseite bleibt Ergänzungen, Änderungen oder Löschungen durch den Herausgeber jeder Zeit vorbehalten. In Bezug auf sämtliche rechtlichen Probleme oder Konflikte wende man sich bitte direkt an unseren Rechtsbeistand, die Medienkanzlei Kaus in München.